Despite always having seen herself as being creative, her talents in photography remained hidden until the year 2000 when she picked up a camera to document the precious moments following the birth of her first son Spencer. And now almost 20 years later Susan is running two of the most successful photography businesses in the north-east from a studio in her back garden. And the mum-of-two wouldn’t have it any other way. But for many years Susan juggled building her own business alongside running Central School in Peterhead and laterally acting as a Quality Improvement Officer (QIO) in the shire. Eventually life working two jobs took its toll and Susan decided she wanted to concentrate on taking beautiful pictures while raising her two boys in Aberdeen. “I thought, you know what my boys are growing up, Spencer is nearly 17 and they will always need their mum but they will only need her to run them about for another couple of years,” she said. Susan’s picture taking skills blossomed under the watchful eye of some of the world’s best photographers after she found herself scooping the top prize in a national competition. She had entered, having been excited by the idea of an all expenses paid trip to London to take part in one of the country’s biggest conferences for the industry. And after having honed in on her skills the year before, by attending monthly sessions in the Lake District, Susan managed to beat off the competition. “It was like one of those lightbulb moments”, she said. “There was a competition on the front of Pro Photographer magazine. It was to win a trip to London and membership to the SWPP which is the Society for Wedding and Portrait Photography. I had no idea what that was because I was a teacher, but a weekend in London sounded like good fun to me. Unaware of the big names in the industry Susan spent most of her time at the conference speaking to anyone who would listen to her and part with some advice. And unknown to her some of the people she sat chatting to at the side of the bar were household names. She added: “I spoke to everyone because I didn’t’ know who the names were and I genuinely didn’t. I don’t know if it was because they felt sorry for me or if they wondered ‘what’s this strange girl from Peterhead doing here, but I made friends with some of the best photographers in the world and in the business just by sitting next to them in the bar. Having made her mark with those in the business Susan decided was thrust into taking photos professionally when one of her colleagues in education, who worked with her in Peterhead, asked her to take the pictures at her daughter’s wedding. And as luck would have it the groom just happened to be a Dons player, ensuring her images were placed firmly on the front of all the bridal magazines. Susan said she was “terrified” shooting the wedding but absolutely loved it all the same. She said: “I would have had to be an idiot not to take good pictures because Emma was beautiful, Scott was gorgeous. Everyone there was gorgeous. And despite generating enough business to work solely as a photographer Susan continued to work within education until two years ago. She had always been used to a steady salary and the thought of giving it all up to be completely self sufficient was scary. However, she said that because of her creative and unique style she is now managing to generate enough business which allows her to earn just as much as she was while working as a QIO. 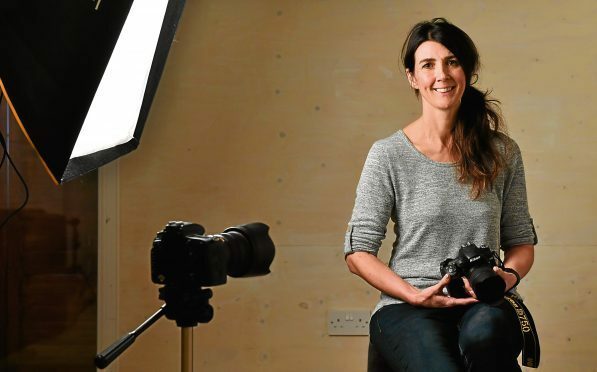 Now, alongside her wedding photography business Susan uses her studio at Kingswells to run another company, Kingshill Studios, where she takes portraits of families, babies, toddlers and even dogs. And driving her in her ambitions is knowing she is able to be the main provider for her two boys.But Susan feels her teaching experience is responsible for making her the photographer she is today. She said: “There is a lot of transferable skills because I have learned the camera craft but it is all about working with people. Working with families, working with children, when I am at a wedding I am putting groups together, it’s made for me. Susan believes it’s not just an eye for photography or a creative mind that makes a picture, she says it’s all about the training and learning you do along the way. And one thing Susan is determined to do is to keep challenging herself as she builds her business along the way. As well as family portraits, Susan has now started to shoot “fine art children’s photos” in her studio. These are created to portray a piece of art work rather than your traditional family snap and is something she believes she can offer as a unique selling point. And despite having loved her career in education Susan is convinced leaving her job to focus her attentions on building her businesses was the right thing to do. She added: “I feel so lucky to be able to do this and I will do it as long as I need to for my boys, and then take it from there. “Loads of people thought I was off my head to lose that security. I resigned from Aberdeenshire Council, two years ago, almost to the day, and I have not looked back. I probably missed a steady salary to start with as when you are working completely on your own you really are standing on your own two feet. The business side to it has been the most challenging because I have always worked for an employer but now I am everyone. I am the person that answers the phone, the person that deals with the deliveries, the person that does the orders, takes the pictures and finds my next client.